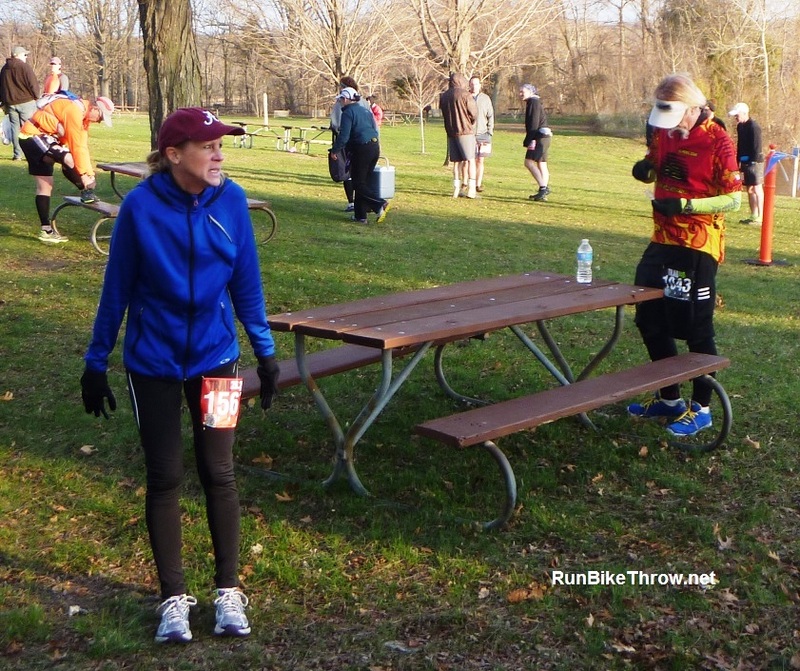 Trail Marathon Recap: No Wimps, Baby! That’s how I described my relationship with long trail runs to someone running with me during Sunday’s 50K. It’s not entirely accurate – I enjoy experiencing being in the moment during one – but I also spend a lot of time fantasizing about it being over. 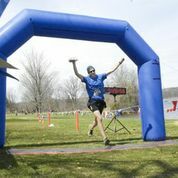 That said, I had a great time at the Trail Marathon Weekend. And I got that No Wimps shirt and medal! Someone told me if you complete the No Wimps Challenge, you have to jump into the lake. Funny, nobody joined me. Wimps! What’s He Going to Do for His Second? Some people start racing with something modest like a 5K, and then there are people like Ben. I met up with him at the halfway point of the second loop, and we got to talking. An experienced hiker (he’ll be hiking to Everest this summer), he thought a trail 50K might be good training. 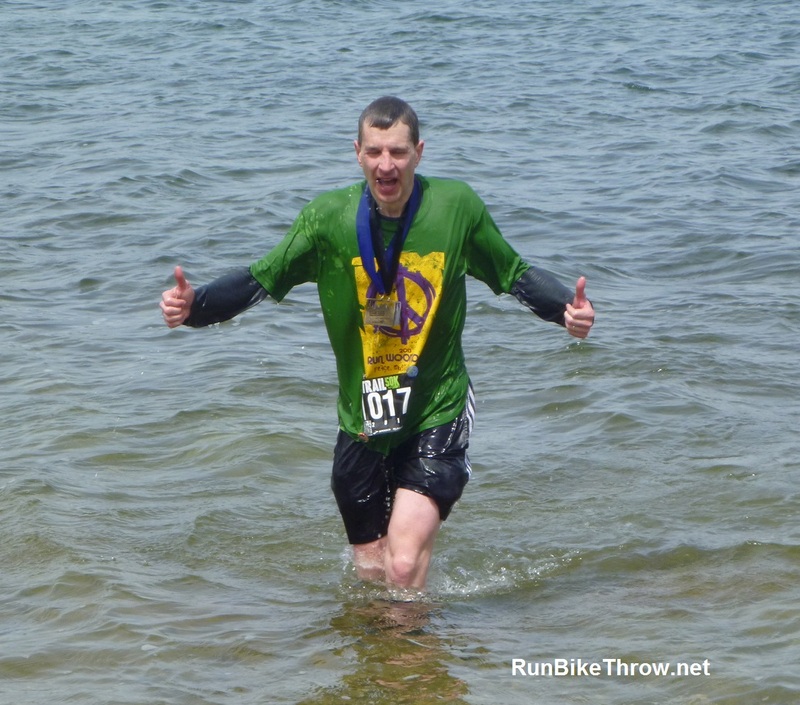 Ben completes his first race ever – a little weekend trail 50K. And as a warmup, he’d run 26 miles on the trails on Thursday, so this was his second marathon in four days. He didn’t qualify for a No Wimps medal, but I wouldn’t have argued if he’d gotten one. About four miles into the second 13-mile loop, I got to thinking how some of last year’s 50K finishers had looked like death warmed over, and by contrast, how good I was feeling. Then I passed a spectator. “Is this your third time around?” he asked. I confirmed it was, counting the loop the day before. “You have some blood coming from your right nostril,” he called after me. I wiped my nose, which had been running more or less continually, and sure enough, there was some blood. Nuts. I slowed down a bit, but kept running – the nearest help was the aid station two miles ahead. But after a few minutes the bleeding stopped and I picked up my pace again. That, plus falling once more (on my right knee again – arrggh) was, fortunately, the extent of my injuries. The Friday before, another volunteer and I worked for over 90 minutes putting together about a hundred peanut butter and jelly sandwiches, cutting them into quarters, and packing them in bags for the aid stations on Sunday. 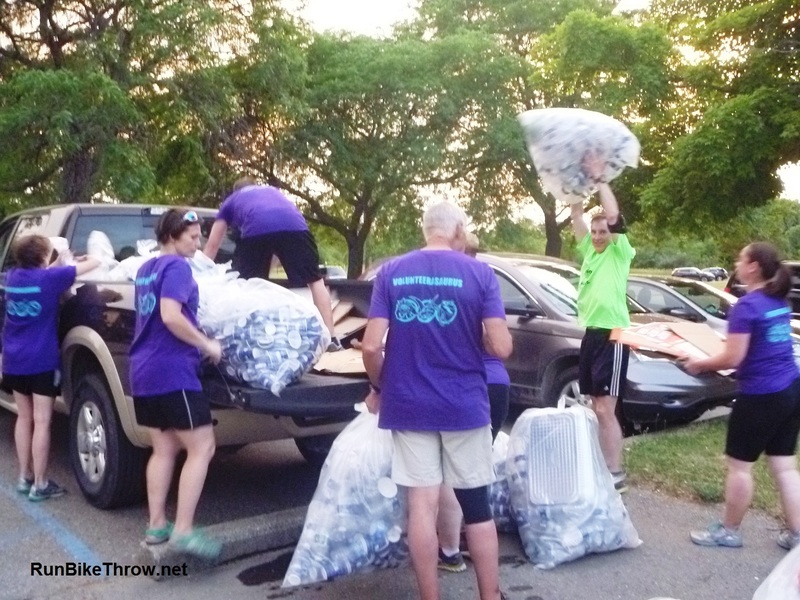 “Do we really need to make all these?” I asked one of the Running Fit crew. So I hope I can be forgiven for being annoyed on Sunday when I caught up to someone holding one of the pieces like he wasn’t sure he wanted it. “What’s the matter?” I asked him. He mumbled something about not being sure of its age or origin. A perfect day – if you were running. Otherwise, it was a tad nippy. Final mile of the 50K, and I’m cruising on adrenaline to the finish line just a few minutes away. I’m passing lots of tired-looking people, and enjoying every minute of it. “You’re making us look bad,” someone said as I caught up to a small group of struggling runners. “Oh, no,” he said. “We’ve got six miles to go.” They hadn’t finished the second 13-mile loop yet. “Sorry about that,” I replied as I passed. I wonder what gave it away. As I neared the end of the first 13-mile loop, some runners came up behind me. They sounded fresher, and I expected them to pass me. But at the next climb they dropped back, and I finished the loop ahead of them. “We expected to catch you,” one of them named Matt said at the aid station, “but you never slowed your pace. Nice job.” They then took off on the next loop while I was adjusting my gear, and I figured I’d seen the last of them. Matt and I battle to the death – or the finish line, whichever comes first. 18 miles later, with just a quarter mile to go, I passed a couple of runners. “YOU again!” one of them yelled. It was Matt. I’d caught up! “Well, let’s make it a race at least,” he said. It was on! We took off sprinting. I was ahead as we crossed the final footbridge, but he kicked it in hard and beat me to the finish line. After finishing, we congratulated each other, and he thanked me for inspiring him several times during the race. I assured him it was mutual. I collected my bling and sealed the deal with a dunk in Silver Lake. As it turned out, I won my age group by over half an hour. 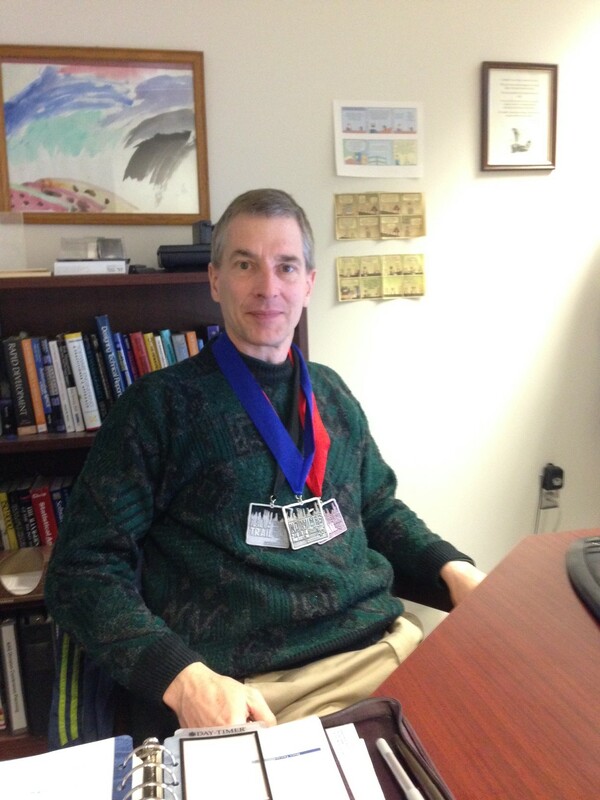 I also saw Ben, wearing his 50K medal and posting “I’m an ultrarunner” on his social media pages. “Best post ever,” he said. 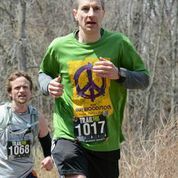 This entry was posted in Running & Cycling and tagged 50, fitness, marathon, No Wimps, Potawatomi, Running, Running Fit, trail, ultra, weekend. Bookmark the permalink.